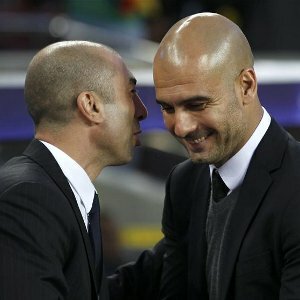 All roads lead to Pep | Who's Playing Who? With Roberto di Matteo shown the door at Chelsea, former Inter and Liverpool boss Rafa Benitez has been appointed as the club’s interim manager through to the end of the 2012-13 season. A fairly handy appointment for someone who’s simply filling in time. There are few doubting the ambitions of Chelsea owner Roman Abramovich. He wants his side to be on top of the world every season. I don’t think it was a question of if, but when, di Matteo would be removed from his position as manager. Even though he delivered FA Cup and Champions League titles in his short tenure at the top, he too was only ever going to be a temporary measure. Those title victories were simply not meant to happen quite just yet. When Chelsea crashed to a 3-0 loss to Juventus in the Champions League this week, it was time. Benitez becomes the ninth manager under the Abramovich ownership. Talk about a massive turnover. But it was always going to be the case. So, where to now? I don’t think there’s any hiding who the top contender for the full time gig is. Guardiola is currently on his season-long sabbatical. I think this break has heightened the hype around the manager. He was the hottest free agent on the market six months ago, and the fervour which surrounds him now is phenomenal. Chelsea aren’t the only club chasing him. Arsenal and Manchester United view him as the perfect replacement to their respective long-serving managers, while Manchester City are ready to do what they do best, and splash even more cash to reunite Guardiola with football director Txiki Begiristain. But it seems Chelsea is the logical destination. Over the past few seasons, their squad has evolved from the tall, powerful, bruising side which would out-muscle their opponents to a smaller, more skilful and mobile set of players. The current squad has arguably been compiled with Guardiola specifically in mind. However, I don’t think we can expect miracles overnight. If (and that still is a big ‘if’) Guardiola is appointed, I hope he is given one thing more than anything else: time. He knew the Barcelona philosophy. He knew the players. The stars aligned, it was the perfect fit. Chelsea would be a whole different proposition. New country, new league, new group of players, new ownership. If Abramovic isn’t prepared to give Pep some serious time, I don’t know who he could possibly appoint next.